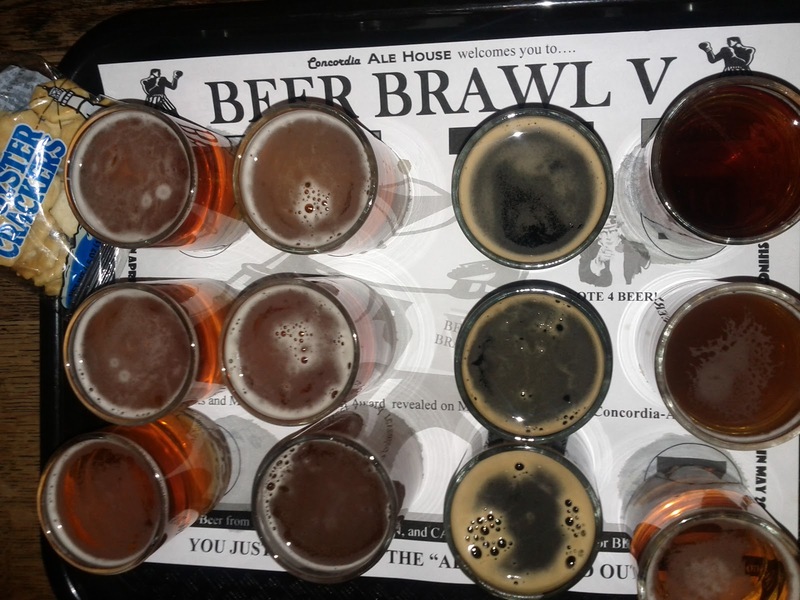 Concordia Ale House is in the midst of another one of their Beer Brawls. In the current incarnation of the Brawl, they're offering up 12 beers divided into four categories: Pale, IPA, Stout and Brewers Choice (which happens to be imperial IPAs). 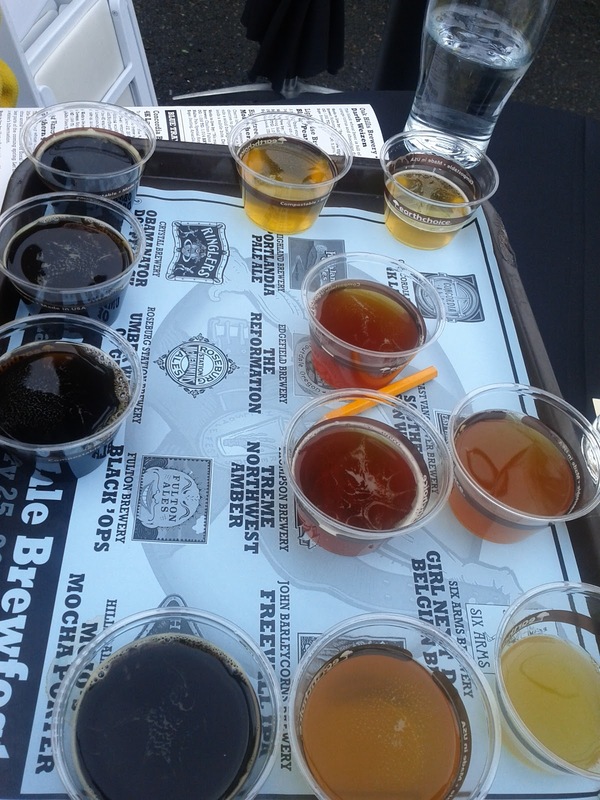 All of the beers hail from either Oregon, Washington or California and it's up to you after tasting your way through the sampler tray to choose one favorite from each of the four categories. At this point you might be thinking, "So, I'm just supposed to pick my favorite? Why exactly would I do this?" I'll tell you why: The beers are merely numbered and put in one of the categories. There is no beer name. There is no brewery name. Once the week-long Brawl is over Concordia will announce the winners from each category. They'll also reveal the names of the beers and the breweries. While I probably won't have a good memory of most of the beers, I will most definitely remember #11, the middle beer in the Brewers Choice category. Last night I was fairly certain of the beer and the brewery who made it. Today I noticed that the Brewers Choice category contained imperial IPAs, which meant I couldn't be right on the beer. But I'm sticking with the brewery - Green Flash. Check back next week to see if I guessed right. 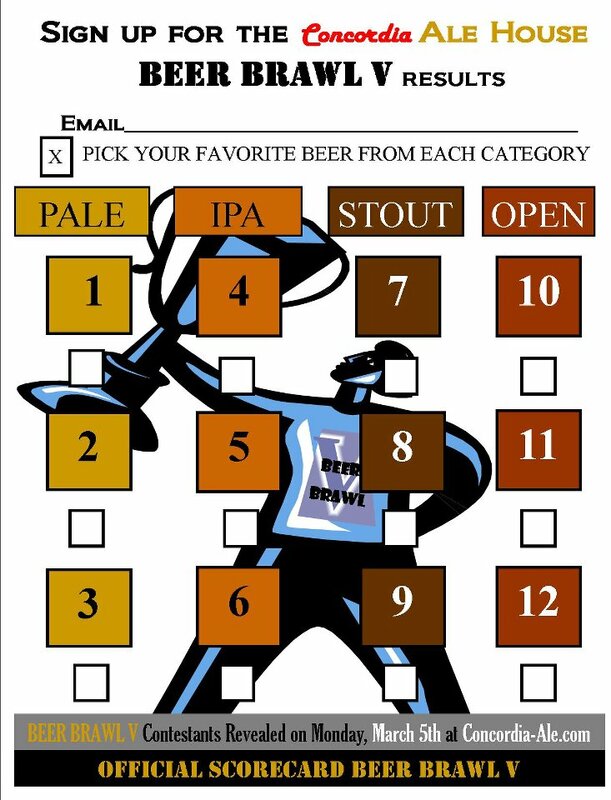 In the meantime, hightail it to Concordia Ale House to cast your own vote. This looks like fun, doesn't it? PLUS, you get oyster crackers! Last year we missed it - or skipped it - I don't remember. This year when friends said they were heading to Hillsdale to sample the beers at The Battle For The Belt we decided we'd join in the fun. As I understand it the reason this fateful festival is still held at a relatively small McMenamins property has to do with its order in the life of the McMenamins empire. It was the first McMenamins brewery and therefore it holds onto the prestige of being the venue where, per the people's choice, the single beer that will represent McMenamins at the Oregon Brewers Festival is selected. 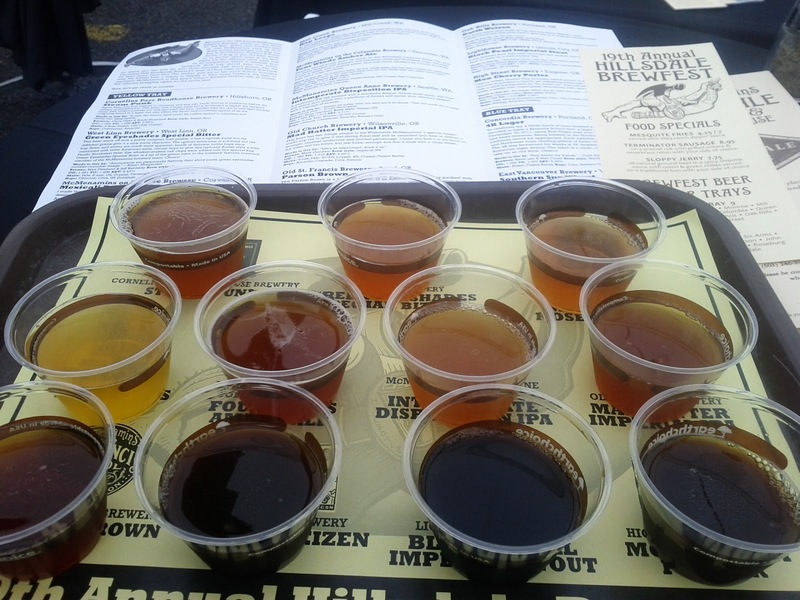 This year there were 22 beers vying for the honor, divided into two tasting trays - yellow and blue. Based on the size of the samples we estimated each tray to consist of one to one and a half beers so we'd be far from blotto sampling all of the beers. In fact, we might even have room and time to circle back for a full pour of our favorite(s). 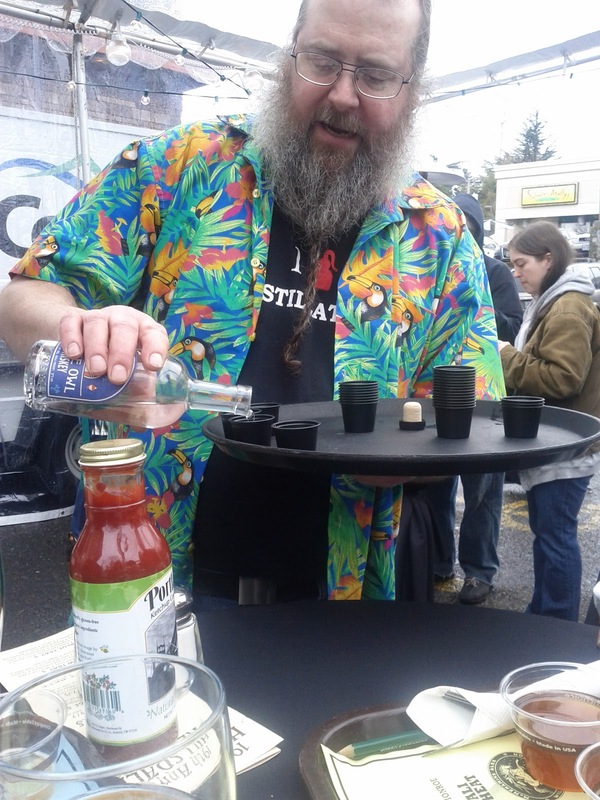 As we sampled our way through the yellow tray a server came around with cake - chocolate raspberry cake - and a little bit later a festive gentleman offering samples of White Owl Whiskey, one of the products coming out of McMenamins distilleries. For not being a consumer of hard alcohol I found the White Owl to be surprisingly smooth. Our friends started trickling in, we finished the yellow tray and ordered the blue tray. While we agreed that the yellow tray had better quality beers overall, we didn't agree on our favorite three beers. In fact each put three different three beers on our ballots. Mine is, of course, the one on the left, naming Hop Loops, a delightfully stanky, single hop (Citra) Pale Ale as the best beer. 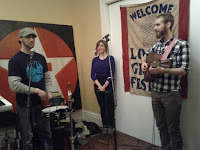 Mag went with the Multigrain Stout, named Umber Waves of Grain, from brewer Tom Johnson. Now the question is, did either of us agree with the majority and pick the winner? Peanut butter and jelly, a childhood favorite that hasn't lost its luster (like hot dogs or bologna) can be as simple as you remember it or it can be complex and mind-blowing beyond your wildest dreams. 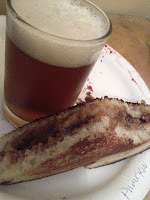 Food cart PBJ's Grilled has been whipping up sandwiches of the latter variety since 2010 and last night they held a first ever pairing with Upright Brewing. PBJ's has a cart tucked into NW in the 23rd & Lovejoy area (in addition to a mobile cart that can be tracked following them on Twitter) and like much of the food that is coming out of many micro-kitchens, it is amazing and creative. Before last night I'd only had one happy run in with PBJ's - a day when their mobile cart was in Beaverton - but right away I was hooked. Last night introduced me to four more of their creations off of their 14-item menu. Betty with Upright Four - Although the sandwich was probably my least favorite, with the white pepper coming across a bit too strongly for me, the pairing worked well. Besides, there were pickles on it! Spencer with Upright Six - Six is one of the Upright beers I'm not a fan of, however, paired with this sandwich, I really enjoyed it. The Spencer is on the more savory end of the menu spectrum and that, combined with the use of rye in both the sandwich and beer, contributed to the success of this pairing. Oregonian with Upright Five - This was one of the sandwiches I'd had previously and although it might sound odd, the blue cheese flavor combines most deliciously with the nut butter and jam used. The hoppiness of the Five was a great compliment. Spicy Thai with Upright Seven - This was the favorite sandwich of one of the folks we met at the tasting. I found it to be reminiscent of the Lucky Lab's spicy peanut sauce (Hawthorne location), just spicier. As a lover of spice, I was thrilled with the bold flavors of the sandwich which were mellowed by the 8% Seven. Hot Hood with Upright Pilsener - This was the other sandwich I'd had before. The sandwich is very flavorful and rich. 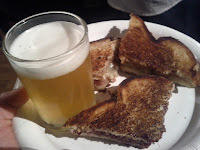 The beer is clean and light but in a way that instead of being overpowered by the sandwich, helped to clean and freshen the palate between bites. Pumpkin Pie with Upright Scotch Ale - The smokiness of the beer, created in part by scorching the wort, worked very nicely with the pumpkin pie-ness of the sandwich. After tasting this paring I'd be quite interested in seeking out the Scotch next Thanksgiving to have with dessert. 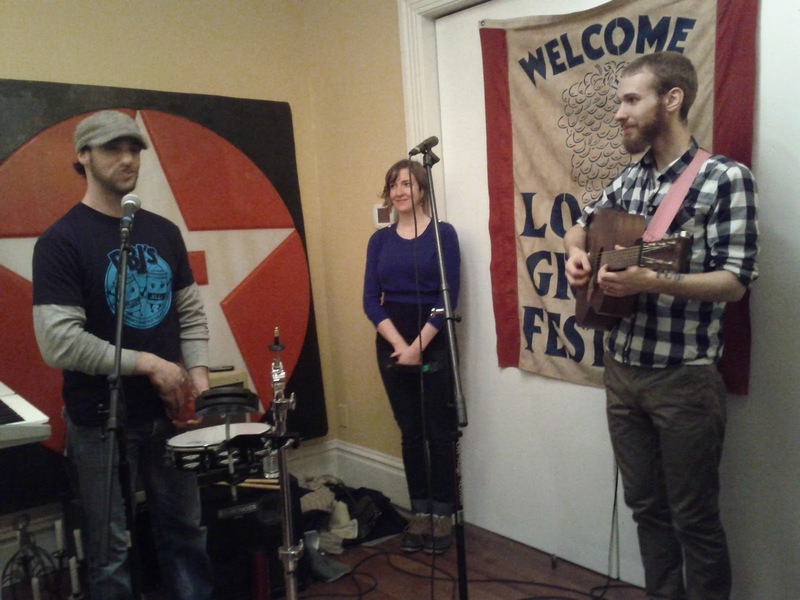 After making it through all six pairings my tastebuds were doing all sorts of happy dances, to the music of the Ascetic Junkies which provided pre- and post-tasting music. It was a thoroughly great evening all around and although I'd like to think I could recreate some of it in my own kitchen I think I'll just look forward to the next tasting. For full details on the sandwiches check out PBJ's menu. Saturday's visit to Gigantic Brewing and the sampling of two of their collaboration beers made an impression on us. Remembering that Apex had recently had four Gigantic collaboration beers on tap, Sunday morning I checked their "Live Beer Board" (on a side note, this is such a great, yet simple feature that I wish more places would adopt the practice) and was pleased to see that we hadn't missed the boat. The Board was still showing four collaboration beers on tap. Mid-afternoon we made the short jaunt to Apex and ordered the other two collaboration beers Gigantic hadn't been pouring. No surprise, Mag went with the Cascadian Pilsner, a collaboration with Laurelwood, and I was happy to fall on the grenade of the Hoppy Hoppy Nano Beer IIPA. He's a pilsner fan to begin with but usually I'll take one whiff and be turned off. 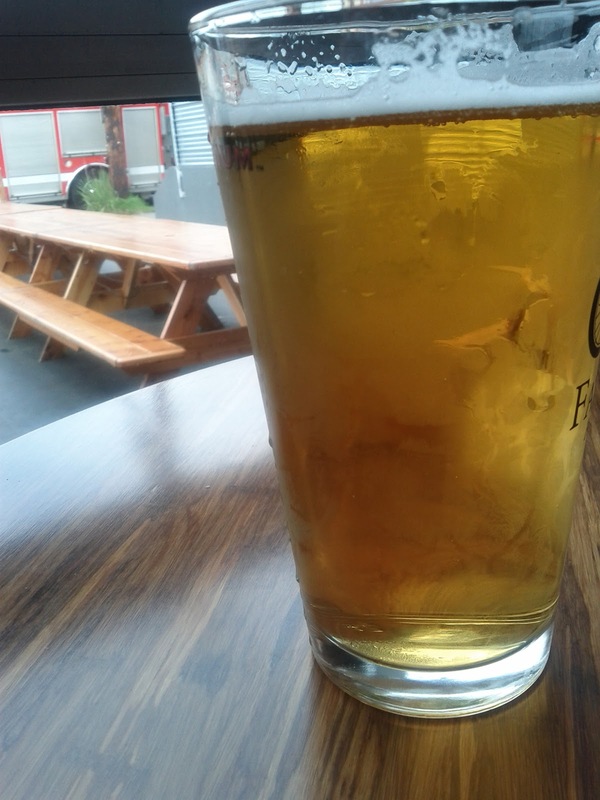 Occasionally, a beer will pass my sniff test so I'll move on to a small taste. Of those few that pass the sniff test, quite a few more fall by the wayside after tasting. This was one of those rare times when a beer made it past both tests, as it offered none of the "pilsner stank" I so dislike. In fact, as I told Mag, this is a pilsner I would actually order and enjoy drinking. My guess is the Cascadian part of the name indicates that it is hoppier than most pilsners and possibly there are non-standard pilsner style hops being used (this is pure speculation on my part). So while I enjoyed the beer, if you're a true to style pilsner fan, know that this will be quite different than that. Who knows, though, maybe you'll be pleasantly surprised as well. By the time I got around to tasting my beer I'd already been impressed with three Gigantic collaborations - the Cascadian Pilsner as well as the Schwarzenfreude Baltic Porter (which interestingly I didn't feel was completely true to style either) and Collabo Wabo (amber/red) was pleasantly hoppier than many ambers/reds. Therefore I'll freely admit I was primed to enjoy this beer, too. Hoppy Hoppy Nano Beer IIPA, a collaboration with Breakside Brewing, was bordering on "big" with 8.2% ABV and poured a beautiful red. For a double IPA I found it to be more hoppy than sweet and although it drinks a bit heavy I wouldn't have guessed it was above 7% ABV. The moral of the story is that if these collaborations are any indication of what Gigantic will be producing on their own, we're in for many tasty treats. That tweet was from one of Portland’s newest breweries, Gigantic Brewing. A brewery which happens to have selected a site only six blocks from where we live. A brewery which, up until now, has not been open to the public. It was a temptation too strong to resist. For Zwickelmania they were pouring two collaboration beers: Collabo Wabo, brewed at Oakshire, and Schwarzenfreude, brewed at Pelican. 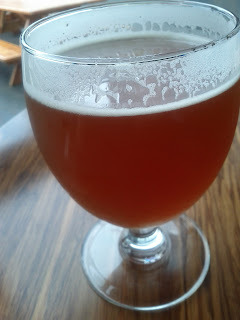 Collabo Wabo appeared to be unfiltered and tasted of a hopped up red. Schwarzenfreude, a Baltic porter, was a balanced version of the style. 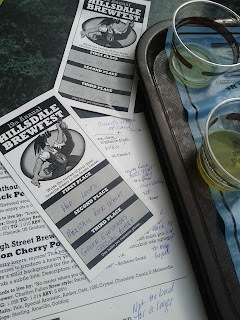 Both were tasty brews and I hope to try more of their collaboration beers until they are up and brewing on their own. 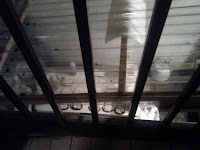 After taking a look at the brewing space and having a chat with Van, who estimated the tasting room should be open by the end of March; we finished our beers and headed out. The visit was inspiring and we decided one more stop wouldn’t kill us. We made the return “trek” home, retrieved the car and made the short, two mile drive north to The Commons. As we walked in Josh’s friendly face greeted us and directed us to one of the corners of the brewery to start with some zwickel. Set up in front of fermenters holding 3-day old Flemish Kiss, 9-day old Urban Farmhouse and 26-day old Biere de Garde, Mike was pouring samples of each. After trying all three we headed back to the front and moved on to full pours – The Gods Must Be Crazy for Mag and Madrone, a tart Saison that I had desired for the last few days since it was put on, for me. We might have actually continued on to a few more places, but we were due back at the ranch to have a repair done. That’s probably for the best since after all my huffing and puffing about what a clusterf$%# I expected the day to provide, I might have had a coronary upon finding even more places with reasonable crowds. As it stands, I’ll eat my crow like a good girl. Warning: What you’re about to read will probably come across as blasphemy. If you choose to continue reading I beg you won’t hold it against me. One last time…are you sure? Today is Zwickelmania in Oregon. Described as, “a free statewide event that offers visitors a chance to tour Oregon breweries, meet the brewers and sample their favorite beers,” by the Oregon Brewers Guild it is no doubt a massive event. And it is truly statewide, not just the Portland metro. That IS pretty cool. I appreciate the effort of everyone involved in organizing the event, all of the places opening their doors and especially the foresight of Brewvana and Rogue to offer shuttles, FREE shuttles around Portland. With so much going on there seems to be something for everyone and if the excitement that has been building all week on the interwebs is any indication, this is a day to clear your calendar and dive in. I’m not fond of crowds. I’m really not fond of crowds that mean I have to wait in line for beer. Unless I’m on a brewery pilgrimage vacation I don’t like having an agenda or multi-stop drinking. I’d much prefer to pick a place and settle in. With a few exceptions I’ve been to all of these places and having been to about 150 breweries/brewpubs I’m not interested in another tour. Sure, my beer geek friends are going to be out in force today and I’d probably be hard pressed to show up anywhere without running into at least one, possibly 10 at any given location. I’d enjoy chatting over beer, as long as the crowd wasn’t overly loud. I’d probably also enjoy a few special tastes that some of the places are offering. But it’s not enough. There it is. I’ve said it. I’ve rained on the beer parade in my new home. I hope you can forgive me. You’ll also know what’s up if you don’t see me today.